Located within the School of the Arts, Media, Performance & Design at York University, the Future Cinema Lab (FCL) investigates how new digital storytelling techniques can critically transform a diverse array of state-of-the-art screens. The FCL is the first dedicated facility of its type in Canada, enabling researchers to design new forms of storytelling, develop prototypes for urban research, and create innovative, subversive projects within networked and hybrid media environments. The FCL is designed as a joint research project between Professors John Greyson, Caitlin Fisher and Janine Marchessault, bringing together their unique and complimentary practices as researchers, artists, and filmmakers within a spectrum of new media practices. In 2009 Professors Ali Kazimi and Don Sinclair joined the lab as collaborators. 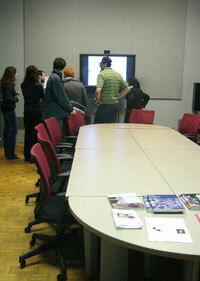 The collaborative research program exemplifies the interdisciplinary approach which is a hallmark of York University. It is highly interdisciplinary in its content and perspectives, as it focuses on new media, technology studies, literary and cultural studies, and the fine arts. In the face of an overwhelmingly powerful entertainment industry that monopolizes the world’s screens and future cinemas, it is urgent that we create research spaces where storytelling can be re-invented for our digital age, outside the pressures of the ad-saturated, profit-driven marketplace.